Its been a long hard summer and because of that i've not been able to put up posts as i would have liked, that is not to say that i've not been busy on the website and collecting information for the site. 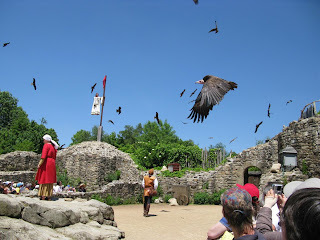 I have put up on the site several new Videos and these include 5 on the Puy du Fou; The Gardens, the Vikings show, the Gladiators, the Falconry, and the Bataille de Donjon I have added videos on Fontenay-le-Comte, The Mervent Forest, Vouvant, and St Gilles-croix-de-Vie. Additional pages on many of the towns and villages of the Vendee have been added as well as more restaurant reviews. It seems that i never have enough time to finish all the work that needed around the gites complex and write more articles for the website. 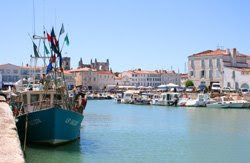 I have tried this week but it has ment burning the midnight oil.Luckily Tate has produced another well time article on the pretty port of St.Giles Croix de Vie so with my addition of La Tranche sur Mer pages its been a productive week after all. With the season now in full swing now is the time to be thinking about the 2010 season. Enquiries and booking are coming in and hopefully the majority of people will have noticed that the recession has not really affected them that much and indeed in many cases they are now better off with the reduction in mortgage rates, the decrease in fuel price and to a lesser extent food prices. Many holiday makers left it too late this year and found that the best properties had gone, so this might in courage them to book earlier, we hope so. It is time to check our advertising to see which worked and which did not. There was a noticeable difference between the top players with several of the usual top performers sadly found lacking this year. It was also noticeable that the larger Gites were more difficult to let, it seems the larger families and groups were having problems. On a different topic we have added more attraction in the Vendee to the site including the Museum Automobile at Talmont St. Hilaire, Museum du Coquillage, Atlantic Toboggan and the L'Aunisceane water park at la Trenche sur Mer. More will be added this week. Many of the visiters to our gites ask for more details on the towns and villages in the vendee, they want to know about their history, attractions, walks, whether they have a market etc., with this in mind I have started to add more towns and villages to the website. 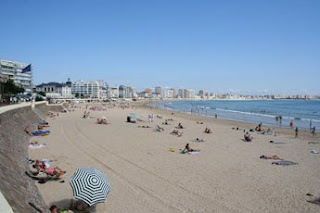 The latest pages are: Les sables d'Olonne, St Gilles croix de Vie and Lucon. Our intrepid critic of all things Vendeen is about to publish his review of the Ile-de-Re, so keep an eye ouit for that. With the Gite season now in full flow I decided to take "Tate" our intrepid reviewer of all things Vendeen including restaurants, off to the Ile de Re. 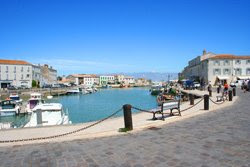 Now before you all write in and tell me that the Ile de Re is not in the Vendee I know it's not, but like La Rochelle and Niort they are all only a few miles out from the southern borders of the department and should be considered as excellent days out while you are in this area of France. I say I took Tate, the truth is he drove his Mercedes van as he needs to transport his mobility scooter to be able to get around. Now Tate will in fact be writing a review of the island which will be a personal account full of his usual wit, but I have published a more factual page with some of the photo's I took while on this prettiest of islands. The world acclaimed theme park of Puy du fou is one of those must see attractions when you are visiting the Vendee, or indeed any other department in the Pays de la Loire. The area around the Puy du fou in the Haut Bocage would not be everyone’s choice of location for a holiday though it is reasonable well placed for visiting the Loire valley. Our Vendee gites at La grange holidays offer an ideal location, just 40 minutes away, situated on the edge of the bocage and the Fontenay le Comte to Lucon praire. La Grange offers 2-3-4 and 5 bedroom gites in a quiet rural setting with great on site facilities and acres of beautiful gardens, close to the renaissance town of Fontenay-le-Comte and just 40mins from La Rochelle and the same distance to some of the finest beaches on the Atlantic coast. There are several ways for gite owners to find clients for their properties and depending on how large your property(s) and therefore your potential income as which will be your best option. It will also depend on whether you want or have the time to handle the work your self. Handling the bookings your self can give you the biggest return, however this will depend on how well and effective your advertising is done and this can be a mine field. Owning your own website is an option, but getting it found by Google is just one of the many obstacles and if you are not on the first page or two of results then the only use of your website is as a source of information for clients who have found you via another source. Advertising using one of the major agencies where you pay them to publish your advert and the booking enquiries come direct to you has been a favourite with owners for years but there are draw backs. You may find that you are in an area where the agency has so many advertisers that there are 20 or 30 pages of then and this is a bit like having your own website and hoping to be found on Google, it is rare for a surfer to look more than a page or two before giving up, though many have filter systems so you can look for say "2 bedroom gites with heated pool”, but again not everyone uses the filters. Another problem in picking the right agency to advertise with is how well they do their job. A site that does well this year may fail miserably the next as has been the case this year with a couple of the major players and of course it's not till you find that no enquiries are coming in that you realise the problem. Advertising with multi-agencies will solve this problem but is costly. Alternatively you can choose an agency who will do all the work for you, find the clients, do the paperwork, collect the money and then after deducting their fee send you the balance. Most of the bigger ones are very efficient at what they do and you can expect a large amount of customers. The draw backs are, they demand sole rights to your property, some allow a week or two for your own use but in general it's out of your hands. The percentage they take can be high, so though you may have many customers your income can be drastically reduced. There is a third choice. There are the smaller local agencies, these usually specialise in their area, do not have huge lists and more importantly most only charge 10% commission and most don't demand sole booking rights. This has great advantages. They are more competitive and have to work hard to secure you clients. You have no money invested so if one doesn't work you have lost nothing. You are free to use as many others or independent forms of advertising as you want its almost a win win no brainer format. It is however better if you use multiple agents to give one overall booking control to make sure you get no double bookings. Our intrepid writer and reviewer of all things Vendeen is now back in his mansion (Chateau) in the south Vendee and this year he has new wheels to get about so we are sure to have more and varied reviews. In the following article Tate explains more about his new found wings which will be followed by articles on how the handicap see the Puy du Fou and La Rochelle. It’s May 2009 and after a long cold winter in Blighty, I’m finally back in the Vendee, but this year there’s a difference, this year Thunderbirds are Go. I’ve been caught in the diminishing mobility spiral for some time. It may come as a surprise to some, but this is not due to me being rendered legless through an over indulgence in alcohol, it is rather as a result of limited mobility. This has lead to a lesser ability to exercise promoting weight gain producing further limitations to my mobility etc. etc. The upshot of all of this has left me spending less and less time out and about and doing things while in the UK and more time at home. The problem has been less prolific in France as when the weather’s good I can spend my time next to and in the pool and as most of my friends have accessible dwellings with plenty of parking, visiting here is much easier. Nonetheless I have still been severely restricted in what I could and couldn’t do, so late last year I bit the bullet and bought myself a Mercury Neo 4 Mobility Scooter, known hereafter as T8 (Thunderbirds 8) and just like that my life was transformed. Places that had been entirely out of reach were now easily within my compass, it didn’t get me dancing but it did get me in the ballroom. I knew that just buying the scooter wouldn’t be sufficient, and that I would need to get it close enough to places to be able to use it effectively, after all scooting to Tesco’s from my house was one thing but scooting to the house in France was way beyond the scooter’s capabilities. Now those of you who are old enough to remember the 60’s TV series Thunderbirds will know that their transport vehicle was Thunderbirds 2, my T2 is a converted Mercedes Vito Van. As in the series everything is remote controlled and automated. The rear doors open electronically and the Ricon lift folds out like a flower opening at sunrise it then lowers seamlessly and I am able to drive T8 onto it. Another touch on the remote and I’m levitated and able to scoot into the belly of the beast, with the lift folding back into the van and the doors closing and locking themselves. The wonders do not end there as I have an electric driver’s seat, some of you out there (Stephen you know who you are) might say better that it was an electric chair. In addition to the numerous Mercedes gadgets on the seat it is independently powered and moves up and down, forward and back and swivels, I’m still looking for the Tea’s made which I’m sure must be concealed somewhere within. This is just a quick note to say that just as Arnie warned “Tate is back” and he’s ready and eager to resume the gastronomic scouring of the Vendee to bring to you a flavour of what is available here. This year because of the shocking mess that the world’s bankers have left us in (I’m so angry that every time I hear the word “Banker” I want to replace the first letter), Trevor and I are going to concentrate on eating at lunchtime and searching for the best value for money that we can find. Trevor himself is looking as fit as a fiddle, although he’s still complaining about his aches and pains. I think his holiday in New Zealand did him the power of good, he seemed to enjoy it there especially the scenery and the winter warmth, and there’s no doubt a few of the local residents were sad to see him go. There are however some woolly residents who I’m reliably informed now baa with a Bristol accent. As for me I made a life changing decision over the winter, my mobility has been declining for some years and this has left some places totally inaccessible to me. This winter I bit the bullet, borrowed some money, and bought myself a mobility scooter which in itself is brilliant but required a Van to transport it. I call them Thunderbirds after the 1960’s puppet series of the same name. Those of you old enough to remember will get the inference, with the mechanical nature of everything in the programs, including folding palm trees, of course there will be those others of you (Stephen you know who you are) who will point at the wooden nature of the characters and say that there the real likeness lies . Whichever way you cut it both the scooter and the van are fantastic and have transformed my life. 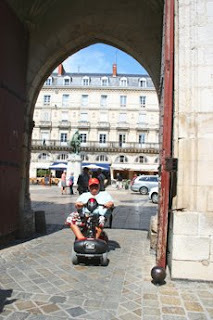 I’m now looking forward to scooting around la Rochelle, seeing the seafront at St. Giles and on Friday Trevor and I are visiting the Grand Parc du Puy du Fou, somewhere I’ve only ever been in the evening to see the spectacular as the walking around the Park has always put it beyond my abilities. Since arriving here a couple of weeks ago I’ve visited Brico Depot and Le Clerc, I’ve managed to look around Trevor’s vast property empire (during the course of which I managed wheel spin for the first time and my first wheelie) and I’ve even shopped at Super U on my own for the first time ever. So LOOK OUT FRANCE. Since arriving with a couple of friends we have eaten out at restaurants on two occasions, both were outside of the remit stated above, one evening was spent at the creperie at the Chateau La Citardiere, which is the subject of a separate review. The other evening was spent at the Pic Vert in Vouvant, a creperie that we have reviewed before. We had a splendid evening there the atmosphere was, as ever, very good as the restaurant benefits from being in Vouvant where English diners proliferate which generally makes the evening sessions busy. The food was much the same as last year which was very good, and the prices had remained unaltered. The only thing that has changed is the exchange rate which takes evenings such as these out of the easily affordable category and puts them into the rare treat category. This is of course not the fault of the restaurateurs it is the fault of the *ankers, and I personally will take every available opportunity to remind them that through their greed and complete disregard for decency and honesty, they are responsible. Advertising your gite and the recession. Although I have touched upon this topic before I thought that you might be interested in some comments I came across this week. The first is a definition of the financial times that we are in. "Recession is basically the reallocation of resources from the scared to the bold. You just need to decide which you are going to be and then not let anyone (especially the media) tell you otherwise." Of course along with that goes the old cliché "when the going gets tough, the tough get going"
I also found an article on improving your conversions. Still, relying solely on the UK market is surely not the best solution for gite-owners and B&B providers, particularly in the current climate. I'm surprised how many websites advertising, only use English! This is fine if you only want to receive visitors from the UK or perhaps the Netherlands; but it is important to remember that across the board, the French make up the lion's share of the customers for gites. In some regions, they represent 80% of gite customers, according to local tourism statistics. Obviously, this figure is lower in tourist hot-spots, such as along the coast. Incidentally, if your gite is registered as a business in France, it is actually - in theory at least - illegal to advertise your services only in a foreign language. Visitor stats show clearly that sites which are posted in both English and in French get more visitors than similar sites with a website in just English. And those who have websites in three or four languages do even better. Of course, there is one way to discourage all but visitors from the UK, and that is to list your prices only in sterling! Most sites list prices in sterling and euros, or indicate that both are accepted, and that is certainly a way to increase your chances of bringing in visitors from France and other parts of Europe too. Advertising in another language is fine as long as the translation is correct, whatever you do, do not use an online translator the results will not impress anyone especially those you are trying to convince that your property is professionally run. I have seen some catastrophic examples of sites with pages in the most garbled and incomprehensible French! You will not bring in French customers if their first contact with you is in the shape of a very poorly written web-page; After all, look at it the other way round! If you are British, and were looking for a holiday cottage in the Yorkshire dales, would you feel inclined to book a cottage whose website was in mangled and incomprehensible English?" I thank Andrew Rossiter for those last comments. In hard times thinking outside the box to find a new angle on attracting customers is the way forward. It is interesting to note that in this recession the downturn is likely to be around 10%, yet raising your prices by 4% would increase your bottom line by 15%, and anyone booking your gite would probably still do so if the price was say £468 rather than £450. It is an interesting thought that raising prices during a recession can in fact be profitable and history shows many examples where this has worked. One example is Showerings Ltd, during the 30's depression they sold Peardrax at 3p per pint (that’s old money) and were going out of business, they were bold and decided to change the price to 1shilling and 3p a 5x increase and at the same time reduce the size from 1 pint to less than a quarter of a pint, the increase in profit allowed for aggressive adverting which lead to the multi million pound brand "Babysham". Only for the Brave. The Video Collection: click on a title to watch the video. Ardoux. 5 Bedroom gite with shared outdoor and heated indoor pool. Sapin. 2 Bedroom gite. Sleeps 6. The Depths of winter is the time of year when most people book their summer holiday. The Christmas festivities are over and the days are dark and dismal so what better tonic than to think of those balmy summer days, hot summer breezes, the French wine and cheeses and of course the crystal blue sea lapping gently on golden sands, you can almost smell the ozone drifting on the breeze. This is of course the picture that travel brochures around the world use to lure you to book their holiday destinations and of course we’re no different. Luckily for us the Vendee is blessed with some of the finest beaches in France, the blue flag for cleanliness is proudly flown from most of them and the choice is extensive. Our review of all of the beaches in the Vendee is now finished and though there will always be a need to keep them updated you will never the less be able to see exactly what’s on offer. In addition there are also further pages on Surfing, Fishing and Sailing. Beach holidays may not be everyone’s idea of a great holiday. Some people do not want the hustle and bustle of crowded resorts or sand with everything, but still enjoy the occasional day on the beach. Rural Vendéen gîtes and holiday homes offer those people a tranquil setting, far enough away from the coast to enjoy the peace and quiet of a traditional Vendéen village, yet close enough to the coast for it not to be a chore getting there with the added bonus of passing through pleasant interesting countryside on the way. The other major advantage of a rural gîte holiday in the Vendée is that the cost of renting your holiday home is dramatically reduced, often by a much as 40% for a similarly sized property. There is also much greater choice in the type of properties available, especially for the larger family or group of friends. Gite bookings get a boost. As the old saying goes "what a difference a week makes". The weather outside may be freezing but the temperature is sure rising in the holiday industry. According to the news over 200,000 holidays were booked last week and that was only with the big operators and virtually everyone I have spoken to has said that they are not only receiving a ton of enquiries but they are converting to firm bookings at above average rates. For those of us that still advertise in pounds sterling, especially if you live in France, then the dramatic rise in the value of the pound this week is as good a new year’s tonic as one could wish for. With a rise of nearly 10% from is lowest point it can make the difference between a successful season and a disastrous one, and I am confident that this rise will continue until it gets back to around 1.30 or higher. Of course there will be the bad days so let’s just keep our fingers crossed that the rise goes beyond even my prediction. On another Front the new look to our sister website www.french-gite-holidays.co.uk is complete and is now live for all to see. I'm sure there will be some tweaking and perhaps the odd link that’s failed, but in general the fresher look and quicker loading has meet with approval by both advertisers and viewers alike. Let me know what you think. I am often asked if having a swimming pool makes any difference to how well my gites rent and does it make any difference if they are heated or not. The answer to the first part is a definite yes, it is not only easier to let your property but also the rate is significantly higher, as to whether its better to be heated, well that’s a much harder question to answer. It would undoubtedly be easier to let a property with a heated pool and as more properties with them come on the market it will be an increasing advantage. It will also depend on the size of the property, for gites with 5 plus bedrooms it is not such a great advantage as there are, in general, fewer of these than the demand so they are usually taken up quickly. The problem with smaller gites is the cost ratio. It is quite expensive to install the heating system and depending on the type of system installed and the size and construction of the pool, the running costs can be quite significant, so returns on investment will need careful consideration. Why do we need a pool? Well the answer is simply.... conception! Think about it, what do you imagine as your dream destination for a holiday? What elements should your dream holiday have? I bet you will imagine a pool with sunshine in that equation some where, perhaps your only sitting by it drinking that cool beer, but its a powerful image so it becomes a must have. It is strange that the reality is often quite different, on many occasions I have had customers demand that they have a pool, its top of the features list that the property must have, yet when they arrive they checkout the pool first, they may even make it there first must do thing, but then they either never use it again or certainly not enough to have justified the increase in price they have paid. A few years ago I was approached by a Frenchman who had a nice gite by the beach just south of La Rochelle, he wanted to know why it didn't have as good an occupancy as I did. I asked "do you have a swimming pool?" no he said "I don’t need one I'm only 50 meters from the beach". So I explained about the concept of a holiday and illustrated it by explaining that a friend of mine has a similar property not that far away from him in a reasonably similar location, he has a heated pool, he charges twice what the Frenchman charged and is fully booked often two years in advance for the whole period from Easter to October. The Frenchman scratched his head and walked away without saying another word. So in conclusion I would say that if you are serious about letting your gite(s) then you should give having a pool very very serious thought.